Co-op Radio is hiring two youth Community Engagement Coorodinators for the summer of 2019 ! The Community Engagement Coordinator is responsible for expanding Co-op Radio's community connections by liaising with community organizations, and promoting our work at festivals and performances throughout the summer. Join us from 6pm to 9pm on Thursday April 25th for our Member Appreciation Event! We want to thank you for your generous and ongoing support by inviting you to the studio for some mingling, drinks and appies. Help us grow our community by bringing along one (or two, or even three) friends who are not Co-op Radio members! Monday April 15th is officially Co-op Radio Day! Co-op Radio first went on air in April 15th, 1975 launched by people from two different groups - the Muckrakers and Neighbourhood Radio. 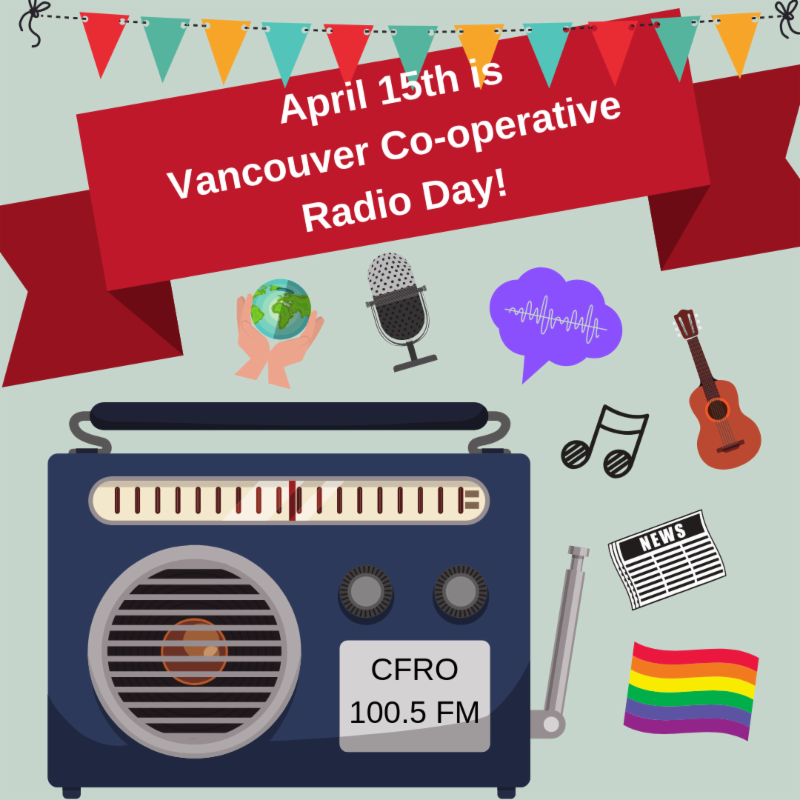 Just a few years back, on April 15th, 2015, the Mayor of Vancouver proclaimed April 15th as “Vancouver Co-operative Radio Day” in the City of Vancouver. Join Ruggero Romano, the host of Room Tone Radio for the screening of his documentary film V6A at The Rio Theater! Dusty is back again with her amazing DIY Tour Booking Workshop April 6th from 2:30 to 5:30 PM at Vancouver Co-op Radio ! The 2019 Spring Member drive will be running from Friday April 26th to Monday May 6th. This is our chance to reach out to the community and thank them for their continued support of not for profilt, locally produced radio. We need your help to make this the most successful Member Drive to date! We are looking for programmers to help us with Member Drive phone calls. Join a Co-op Radio Committee ! Are you a programmer looking to delve deeper into the inner workings of Co-op Radio? Look no further than joining a Co-op Radio Committee! These Comittees are a fun way for members to get involved with everything from producting PSA, to faciliating training and repair tech gear! Folk music and farce, show tunes and satire, poetry and parody, odds and ends. On March 1st, 2019 Ragbag will celebrate 40 years since debuting on Vancouver Co-op Radio in 1979. Although the show has taken breaks and even moved stations temporarily in the 80s, we're thrilled to showcase the radio magic of Steve Bowell with a special 2 hour episode. Are you a band ready to embark on your first tour, but don't know where to start? 2019 Training Sessions Sign Up - Learn Broadcasting Skills! Here is the training schedule for Winter and Spring 2019 ! We are hiring a Fundraising Coordinator! Co-op Radio is hiring a part time Fundraising Coordinator to add to our new staff team. 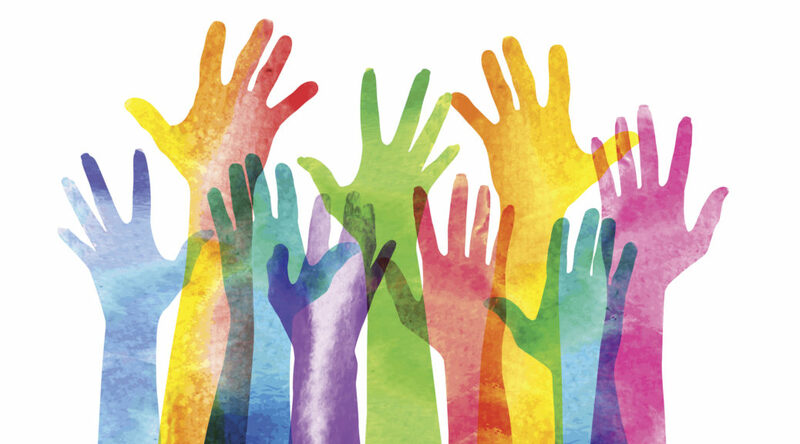 We have a fun, supportive and inclusive workplace, raise over $250,000 from dedicated supporters each year (many of them monthly), and we look forward to learning from your experience to grow our programs. We are looking for a fresh, intelligent individual to add to an energetic and eclectic team. We value self-confidence, self-reliance, and demand attention to detail. Our online stream is currently down. This means that we are broadcasting on 100.5 FM, but online and smart phone streaming is not active, which also means there will be no web archives until the issue is resolved. Stay tuned. We are working to resolve the issue. AGM 2018: thanks for joining us! We had a big turnout for this year AGM that took place a the Dobson Hotel, one block from the station. Thank you all. You rock! Thanks to our new board members and thanks to the ones who stepped down this year! We could not do it without all of you, members, volunteers, programmers, staff and board members. Mount Seymour Transmitter Was Down this morning! Thanks to all the listener's who phoned and emailed. Vancouver Co-op Radio's transmission was interrupted this morning due to trouble at the broadcast tower on Mount Seymour! The online and smartphone broadcast continued working, only the FM signal was affected. Huge shout out to Dan Roach and the crew at S.W. Davis / Broacast Technical who diagnosed and repaired the problem. Fans of Rock Talk who missed the show today should email community@coopradio.org to receive a podcast of today's episode. Celebrate The URP on Vancouver Co-op Radio 100.5FM at Vancouver Co-op Radio CFRO Sixth Year Anniversary Party with DJ Denise & Denzin 8 Productions, Red Shirt Mike & Bangz aka Michael Mubanga, plus some of Vancity’s most powerful DJ's & EMCees. Co-op Radio is Proud to Welcome Lạc Việt Radio! Tune in every Thursday from 9 - 10 AM for your connection to the Vietnamese community in Vancouver, B.C. and beyond! This week on Jabulani, Abdel Naroth was talking with Lili Vieira, vice president of Vancouver latin American Cultural Centre Society (VLAAC). VLACC presents a dazzling concert showcasing Brazil's multi-faceted musical culture in "Aquarela do Brasil: An Explosive Celebration of Music and Dance", November 8 & 9 at Vancouver Playhouse. Thursday November 1st from 10 AM - 11:30 AM join us for a very special broadcast of "Conversations with a Monster" a radio play written by David Angus MacDonald. Aloha Monday Live Music KINO CAFE Sunday October 28! Enjoy a variety of live music anywhere from Gypsy Jazz to Hawaiin! With local radio legend Jim Burnett as emcee for a night to remember. The Kino serves delicious tapas and has a great selection of drinks. Enjoy the warm atmosphere with your friends and family while supporting community radio in Vancouver! Read the full article by clicking HERE ! Join Co-op Radio progammer Krusheska Quirós for a special Audacity audio editing workshop! Fall Member Drive from October 19 to 29! Be ready for our Fall Member Drive, from October 19 to 29! We have Member Drives twice a year because we want you to be part of growing our co-operative and making it stronger. We invite you to renew your membership or become a member in the coming 10 days. Your contributions are what keep us going. We are listener-supported, and our members’ contributions and supporters’ donations make up a half of our operating budget. You help keep the community programming you love commercial free. Enjoy a variety of live music anywhere from Gypsy Jazz to Hawaiian! With local radio legend Jim Burnett as emcee for a night to remember. The Kino serves delicious tapas and has a great selection of drinks. Enjoy the warm atmosphere with your friends and family while supporting community radio in Vancouver! Do you make music? 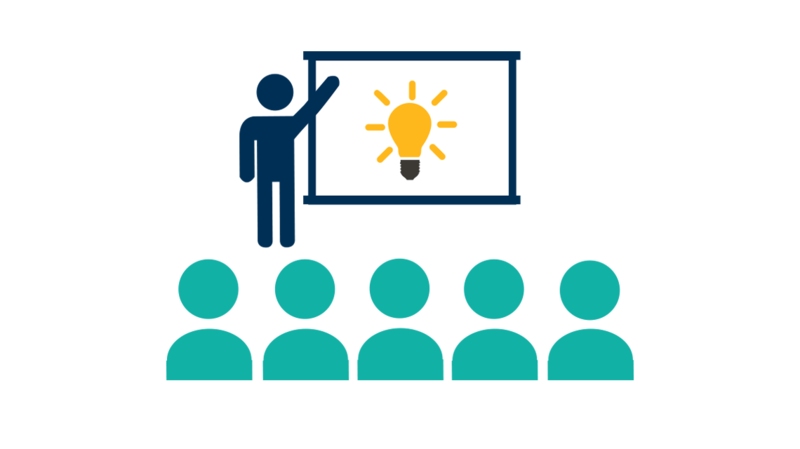 Do you want to share it with a wider audience? Attend the !earshot Digital Distribution System Information Session October 9th at Creative BC ! Join us on September 26th from 6 - 9 PM for Co-op Radio's Open House. snacks bevarages and music to add to the atmosphere. Friday Night: We're Dancing For World Peace! Join host Kimit Sekhon as Vancouver Co-op Radio and Decentralized Dance Party unite the ENTIRE city in joy and celebration!